Questions? Write us a Mail! Get a free Online Consultation! Quick, easy and free of cost! Be fast socially acceptable again! We have the best facilities to develop hair replacement surgery in an environment safe, intimate and comfortable. Everything is designed for patient comfort. Learn more about the experience of Dr. Michalis. FUE and FUT (Strip) since 2003! Surgery and Hair experts in finding solutions to problems related to alopecia. Our priority, both in design and density, is the naturalness in every one of the outcomes of our patients. The best and latest techniques available to our patients to achieve excellent results. Many patients worldwide searching in the Internet for Hair Transplant, but when it comes to possible shavings the most patients are not really happy about this idea. Here Dr. Georgiou Michalis can offer solutions with a non shaven option in his Clinic in Cyprus and in Spain. Dr. Michalis has been offering professional hair transplants since 2003. In most things he has been trained by the well-known hair surgeon Dr. John Cole and Dr. Christian Bisanga. 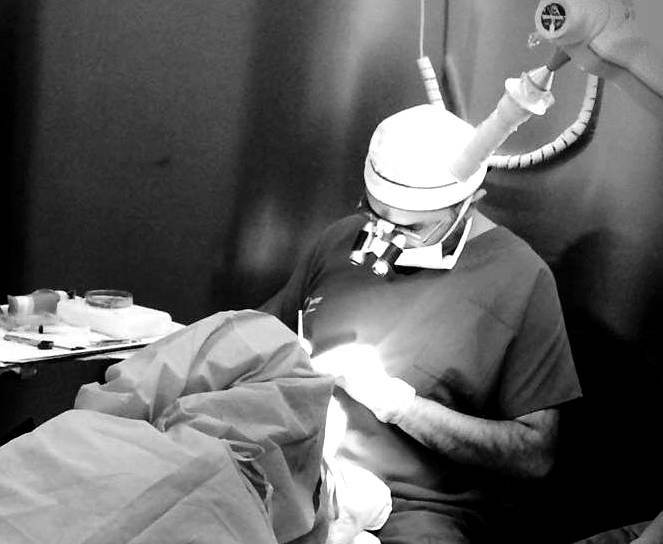 Dr. Michalis has been operating since the beginning with the FUE Follicular Unit Extraction technique, as well as with the FUT (strip) method and above all, since the beginning of his career he has already offered hair restoration for men and women without cutting the hair in the recipient area. Dr. Michalis has a lot of experience: 1. with hair surgery fundamentally 2. with the FUT and FUE technique but 3. also with transplanting into existing hair (long hair/unshaved). Since years he is now offering hair transplant without shaving head. The most women and men, as well as people who are in representative occupations such as actors, lawyers, managers, doctors, and all who deal often with people are afraid to shave the hair completely for a hair restoration surgery. All of these people have in common that everyone wants to be able to be sociable as soon as possible again and that the crusts and redness after the surgery can be well concealed. That`s the reason that many of them people searching for FUT or FUE without shaving. Dr. Michalis can help here with his unshaved hair restoration, in which there is no need of shaving the head or to shave the recipient are neither with FUE nor with FUT. Thus (if there are enough hairs in the recipient area) the crusts and rednesses could be well concealed and patients can go back to normale life a lot faster after a unshaved surgery. Read more about our locations in Barcelona – Spain and in Nicosia – Cyprus. One of the advantages in Cyprus are the overall favorable costs and price structures, such as for rent, staff. Thus the surgery in Cyprus can offer more cheap. Not quite as favorable (cheap) as in Turkey such as Istanbul, which still have lower overall costs like Cyprus, but the prices in cyprus are much cheaper and more attractive than in many countries and cities of Europe, like UK/United Kingdom – London and also in compare to countries in continents like USA or Australia. Read more about our Prices and Costs in Cyprus and Spain. The bad situation around the world regarding security and terrorism is in the meantime well known. The latest events with terrorismus in Turkey (Istanbul – Ankara) and other cities like in France – Paris and Belgium – Brussels have certainly frightened many people. Regrettably, most likely, countries and cities such as Turkey Istanbul etc. now possible will have much less tourists or hair transplants in turkey as before the terroism events. It is also conceivable that patients regarding the last events not will opt for a surgery in Turkey, Istanbul, or other cities. Due to recent events, and since Cyprus is close to Turkey, Ankara and Istanbul, many patients ask about the security situation in Nicosia in Cyprus. We can assure that so far Cyprus is very safe, which is confirmed by the embassies in many countries. Moreover, Cyprus is a beautiful country with beautiful beaches and Cyprus invites you to a warm welcome on a visit. You can easily connect the hair replacement surgery with a holiday in Cyprus. A team willing to solve their hair problems with total professionalism. The Dr. Michalis is internationally recognized for its expertise in the field of hair restoration. Highlights its artistic sensibility, respect the wishes of the patient and the pursuit of naturalness in each of their cases. The Dr. Michalis has an experienced team of technicians dedicated to hair transplant for more than a decade . His exquisite, experience and professionalism will make the patient feel comfortable and relaxed throughout the process. A good result requires a total complicity between the doctor and his team. Feel free to contact us every time! Ask for a Online Consultation!